I remember eating in that Sambo's as a child. Thanks for posting. 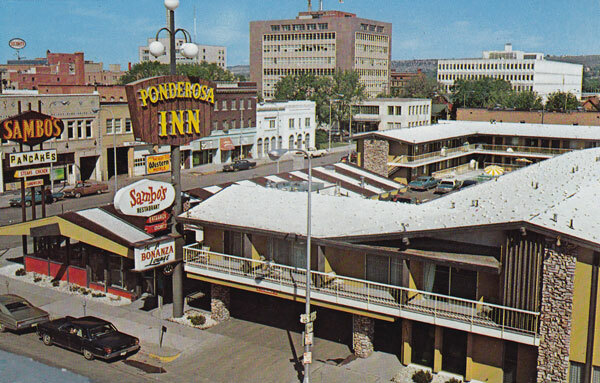 I remember the Sambo's in Bozeman, too ... they used to have great breakfasts! The one here is a Chinese restaurant now. Thanks for the note, and I'm glad you enjoyed the post. -a Bob's Big Boy that is now a Noodle World. Pan-Asian restaurant, modest prices, owned by a Thai-American (who owns a chain of restaurants in this area). The current menu fits the heritage of Bob's--Vietnamese Pho', for one example. -an Alpha Beta supermarket that is now a Hawaiian Supermarket (pan-Asian products, fresh seafood (turtles! ), it's across from a Ranch 99 Market, which is the larger chain of supermarkets in this Chinese/Vietnamese and bits of Thai/Japanese area. I never really _liked_ Sambo's menu, nor the surviving Denny's (hmmm, Big Boy survives in some areas, yes?). But these _are_ very much a part of 20th-century American culture. I'm glad you're reminding us of these moments, Mark. I hadn't thought about the notion that Chinese restaurants tend to inhabit recycled buildings, but it may be true ... one of my favorite Chinese places in Butte was once a Hardee's. As for Sambo's, my only memories of it are the breakfasts -- lots of cheap pancakes! The Big Boy restaurant in Bozeman closed a few years ago, and I don't think there are any left in this part of the but I know they exist elsewhere. None of those are my favorite places to eat ... but they're great reflections of an era, all right!